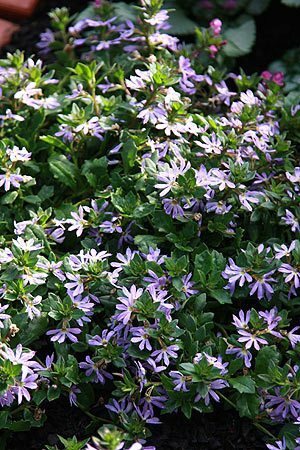 A tough native groundcover plant Scaevola aemula are often called the ‘Purple Fan Flower’ and Fairy Fan Flower. The genus is found right across Southern Australia. This is a hardy easy to grow plant, excellent in containers as well as in the garden. The name comes from the arrangement of the petals in the form of a ‘Fan’, and flowers can be the usual purple, pink or sometimes white. In general Scaevola aemula require a sunny position and a well drained soil, however some species are desert dwellers and some are from forests, so choose according to situation. With such widespread distribution, many forms exist, some are small shrubs to 1m while many are lower growing with a more trailing form. Generally speaking these are a hardy plant that require a humus rich well drained soil. A little extra moisture during long dry periods is recommended and tip pruning regularly will keep the plants in good shape. Mulch to retain moisture and use a low phosphorous native plant fertilizer in early spring. 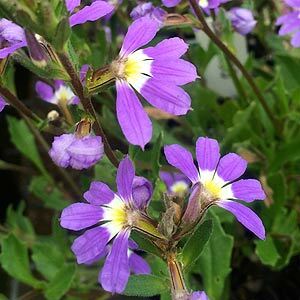 With clusters of mauve flowers and a touch of cream towards the centers, scaevola aemula the ‘Purple’ or ‘Fairy’ Fan Flower makes a great addition to the garden. S. nitida ‘Sapphire Skies’ is an upright form with pale blue flowers. Scaevola Zig Zag is a low growing form great for the rock garden. Scaevola ‘Purple Fanfare’ is another great groundcover cultivar. S. albida or ‘Coast Fan-flower’ is another worth considering.